Jules Dupré was born in Nantes on April 5, 1811. His father was a porcelain manufacturer in Parmain – a small village on the shores of the Oise -- and by 1822 Jules was working in the factory decorating plates. In his spare time he painted simple landscape studies from nature and finally traveled to Paris to study with Jean-Michel Diebolt – the landscape and animal painter. In the late 1820’s his father was appointed director of the Coussac porcelain factory near Limoges and Jules took this opportunity to sketch and paint landscapes in this region. 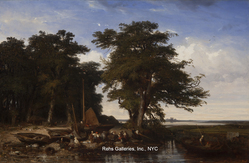 In 1831, at the age of 20, he made his debut at the Salon – showing a number of landscapes and continued to exhibit there sporadically. That same year he was invited to London where he spent time studying the works of the English landscape artists and painting in the English countryside. 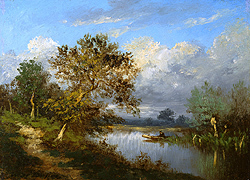 It is believed that Dupré was responsible for bringing the English landscape style to France and blending it with the style and images of the Barbizon school. His “View of the Fields near Southampton,” in 1835, had won him congratulations from all the golden youth of the Romantic school, and the friendship of Decamps, Jardin, Eugene Devéria, and Eugene Delacroix, who indeed, was never tired of seeing and studying this picture. 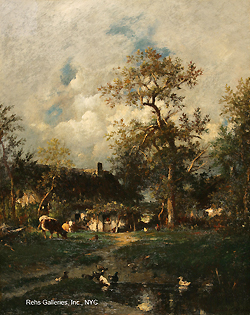 Jules Dupré became, almost from his début, one of the favorites in public opinion; his farms, his cottages, his old oaks on the boarders of pools with cows ruminating about, his plentiful pastures where horses run with flowing manes, his mills which profile their silhouettes on a stormy sky, have a simple and truthful side which captivates all the world. The precocity of his success only developed his activity; he is always at work, and gives himself up to incessant production, although he appears but rarely at our expositions … One may have more or less sympathy with the works of Rousseau or with those of Dupré, but these two masters will remain incontestably as the two grandest colorists in landscape which the contemporaneous school has produced. It was also during this time that he met, and became friends with, Theodore Rousseau. There friendship would last through the 1840’s and the two not only traveled together throughout the French countryside in search of new subject matter, but also shared a studio where they worked, side by side. Jules Claretie, a relative of Dupré, made the following comments about the artist and his relationship with Rousseau in The Magazine of Art: [even at the height of his career, he would carry] his young friend’s pictures from one to another, showing them off, praising them and making three several efforts to have one of Rousseau’s landscapes exhibited at the Salon. He even induced him to leave his attic room in the Rue Taitbout, and took a studio for him, where the two painters, working side by side, produced not a few pictures which will count to the credit of the modern French school. This exposition is to Jules Dupré a sort of dazzling début, although his fame is already old. For a long time, we know not why, this great artist has sent nothing to the Salon; and if he works, it is in the solitude and silence of the studio. The young generation, who did not see the splendid putting forth of art which followed the revolution of July, is astonished before the pictures of Jules Dupré, by this boldness, this zeal, and this brilliancy. We are no more accustomed to these superb extremes, to this excess of strength, to this overflowing power, to these full-faced struggles with nature. This excessive scale dazzles the eyes habituated to the sober regime of gray. By the mid 1860’s he began to spend most of the summer months in the coastal town of Cayeux-sur-Mer – painting marine and shore line landscapes. In the late 1860’s Millet joined him during his summer sojourns and in the early 1870’s Courbet could also be found painting in this area. It was not until 1867 when Dupré began to, once again, submit works to the Salon and it was at this exhibit where the artist was awarded a second-class medal. Clarence Cook made the following remarks about the artist in his book Art and Artists of Our Time: Dupré … appeared as an innovator leading the public away from the epic grandeurs of nature to the quiet pastures, to the rich domain of farms and cattle-breeding meadows, to the calm depths of the forest, or the interiors of the farmer’s cottage. His pictures were rural poems, instilling quiet, happy thoughts, and from the first they won for him a warm place in the public heart. But he seemed quickly sated with applause, and since that time has exhibited little. “The truth is.” As one of his biographers says, “he is an artist who cares nothing for money or fame, and everything for art: he is able to follow his bent, and to do as he pleases, and he has his reward.” He has painted all aspects of nature and all the he has produced with a poetry that is the outcome of his own communing with nature, not borrowed from books nor inspired be the work of other men. Dupré continued to spend much of his life in isolation and would exhibit at the Salon through 1883. He died on October 6, 1889. Today Jules Dupré is considered by many to be one of the most important and influential 19th century French landscape artists.